This Avent Spout cup is great for both toddlers and parents. The soft silicone spout makes sipping easy and fewer parts ensure easy cleaning of the cup. it comes to caring for your baby, you want to have complete reassurance that every choice you make is the best.The soft silicone spout makes sipping easy and fewer parts ensures easy cleaning of the cup. The one-piece silicone spout is easy to drink from: liquid starts flowing when pressure is applied to the spout. The valve is built into the spout, ensuring assembly is fast and hassle free. Container of the sippy cup is designed to allow easy grip for little hands. 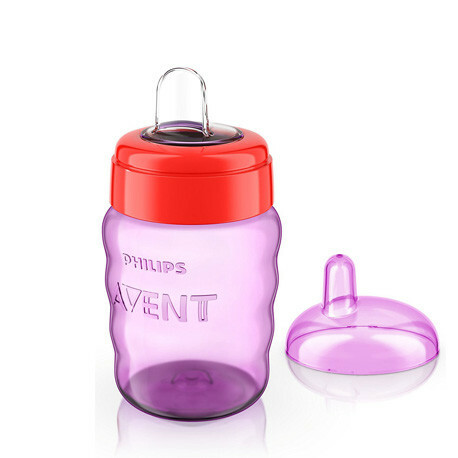 All Philips Avent bottles and cups are compatible excluding the glass bottles and the Grown-up cup. So you can mix and match to create the perfect cup, suiting your toddler's individual development needs. The one-piece silicone spout is easy to drink from: liquid starts flowing when pressure is applied to the spout. The valve is built into the spout, ensuring assembly is fast and hassle free. Container of the sippy cup is designed to allow easy grip for little hands.